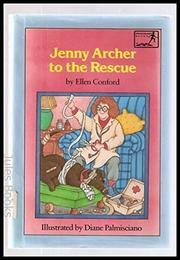 Conford sticks to her proven formula in this fifth "Springboard Book" about the irrepressible Jenny. Jenny's latest enthusiasm, inspired by a news article about a "Young American Hero," is first aid. Her parents maintain their customary bemused stance, buying Jenny a first-aid kit and commenting gently on her futile efforts to find someone to rescue, which culminate in the usual discouraging disaster. After calling the fire department to put out a harmless trash fire, Jenny moves on to her next interest: becoming a Nobel Prize-winning scientist. Though the pattern is becoming worn, Jenny herself is still an endearing character in this reliable series of easily read chapter books.